The Republic of Cuba is an island country in the Caribbean. Cuba is located in the northern Caribbean, at the confluence of the Caribbean Sea, the Gulf of Mexico, and the Atlantic Ocean. Cuba is south of the eastern United States and the Bahamas, west of the Turks and Caicos Islands and Haiti, east of Mexico, and north of the Cayman Islands and Jamaica. The country consists of the island of Cuba proper, the Isla de la Juventud, and several archipelagos. Havana is Cuba’s largest city and the country's capital. Santiago de Cuba is the second largest city. 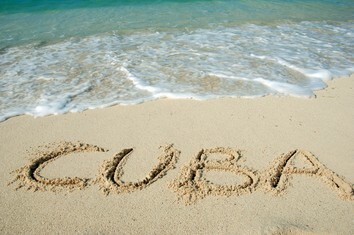 Cuba is home to over 11 million people and is the most populous insular nation in the Caribbean. Its people, culture and customs draw from diverse sources; these include the aboriginal Taíno and Ciboney peoples, the period of Spanish colonialism, the introduction of African slaves, and its proximity to the United States. Spanish English is widely spoken. Rum is always a safe bet. Cigars are also a very good buy. However, beware of fraud. Local crafts are also available and these include beautiful wood carvings, handicrafts made of metal, as well as leather goods and ceramics. Phone calls from hotels are very expensive. Instead have your family members call you at the hotel. The local climate is tropical, though moderated by northeasterly trade winds that blow year-round. In general, the dry season is from November to April, and the rainy season is from May to October. The average temperature is 21°C in January and 27°C in July. Morro Castle Spanish is a picturesque fortress guarding the entrance to Havana bay in Havana, Cuba. Juan Bautista Antonelli, an Italian engineer, was commissioned to design the structure. When it was built in 1589, Cuba was under the control of Spain. The castle, named after the biblical Magi, was later captured by the British in 1762. In the center of the Plaza de la Revolucion is an unmistakable memorial to Jose Marti. At the base is a large statue of Jose Marti in white marble, and below the statue is the entrance to the interior of the Jose Marti Memorial, which contains a museum on Marti. There is also a lift, which visitors can take up the tower for incredible views over the Havana. Cayo Coco is an island in central Cuba, well known for its luxury all inclusive resorts. It lies within the Ciego de Ávila Province and is part of a chain of islands called Jardines del Rey ("King's Gardens""). The cay is administered by the Morón municipality. It is named for the white ibis, locally called Coco birds." The Memorial Comandante Ernesto 'Che' Guevara is the biggest attraction in Santa Clara, the city that is forever associated with the name Che Guevara. Located in Plaza de la Revolution, the monument consists of a bronze statue of Che, complete with a broken arm in a cast, along with a relief showing the revolutionary in battle. Valle de los Ingenios, or Valley of the Sugar Mills is a series of three interconnected valleys in Cuba. The three valleys, San Luis, Santa Rosa and Meyer, were a centre for sugar production from the late 18th century until the late 19th century. At the peak of the industry in Cuba there were over fifty sugar mills in operation in the three valleys. The Catedral de San Cristóbal de La Havana is the seat of Jaime Lucas Ortega y Alamino, the Cardinal Archbishop of Havana, Cuba. Set in the former Plaza de La Ciénaga or Swamp Plaza, the Cathedral is said to be the only example of a baroque construction that possesses asymmetrical features - one of the towers is wider than the other. Cienfuegos is a city on the southern coast of Cuba, capital of the province of Cienfuegos. It is located about 250 km (155 miles) from Havana, and has a population of 150,000. The city is dubbed "La Perla del Sur"" (Pearl of the South). Cienfuegos literally translates to ""Hundred fires""." Guardalavaca is a town in the Holguín Province of Cuba. It is a tourist location due to its white sandy beaches and warm waters. It is located on the northern shore of Cuba, bordering Bahia Naranjo, on Cabo Lucrecia, and is part of the municipality of Banes. Beaches in Guardalavaca include Guardalavaca Beach, Playa Esmeralda, Don Lino and Bahia de Naranjo. Viñales Valley is a karstic depression in Cuba. The valley is located in the Sierra de los Organos, just north of Viñales in the Pinar del Río Province. Tobacco and other crops are cultivated on the bottom of the valley, mostly by traditional agriculture techniques. Many caves dot the surrounding hillfaces.